I have been a single father, for, well feels like, Forever. In reality only for this last incarnation the past 2 decades. There was one incarnation where I was a sculptor, then I did an incarnation as a craftsman, then, when I was in my early 40’s, I became a father. Nathan will be 18 in August. Then come September he leaves home,away from me where he and I have lived together most of his life. Whaaat!?! Leaves home??!! Yup. Still getting my mind and heart around that. At the age of 17 almost 18 my not so little Leo is leaving home in a couple of months, going to school in another city, studying horticulture of all things! I feel like a proud father. Horticulture? There’s another oddity. He never showed an interest in working with me when asked over the years. I guess something rubbed off!! Not complaining! After 10 hours of tenacity, trying to repair his air-soft rifle, he went out to play in the woods with a friend. A little game of hide and seek and using each other for target practice. Fun, apparently. When he arrived back home he discovered he did not have his phone or his wallet. I took him to find his wallet in the woods. We revisited the spot where he had crouched in the tall grasses ambushing his friend. Proceeded to look for his wallet which we could not find, but, we did find a mushroom, then another mushroom then found we had spent almost 2 hours hunting mushrooms, talking about mushrooms and pretty much everything else we could talk about including some things I hadn’t gotten around to discussing with him. Like my thoughts about what I might do when he left the nest. That I really would no longer have a reason to be where I had been for all these years since the only reason I chose to be here was because of him. It was a lovely and very timely experience life had lined up for us. Wild mushrooms have been one of my passions for many years, yet I’ve never taken Nathan out to hunt mushrooms, (except when he was a baby and strapped to my front in a baby carrier). 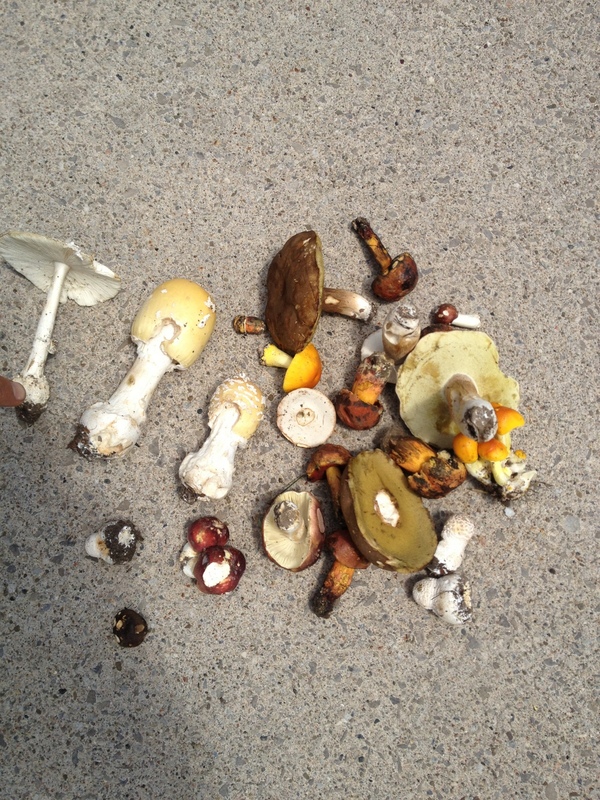 It just seemed to come together in a very natural way, and sparked his own dormant mushroom passion. Questions and answers then more questions, hypothesis and theories on these so unusual representatives of Nature. We spoke of rulerships, planets and plants, moon cycles, the Moon, the subconscious and emotions, (dark of and bright of our emotions and the moon), and the moons pull and influence on water, emotions the subconscious. The unique growing habits of mushrooms. The moon and Saturn as rulers of mushrooms, ebb and flow of their mysterious growth habits. Saturn’s position of the great teacher, setting limits and boundaries, endings. And whether these specimens would continue their unfurling if moved from where they were. Or if they were dependent on the supply of nutrients, (or energy), from the barely perceptible strands of mycelium. So we conducted an experiment, bringing some home to see if they would continue their unfolding. (Nope!). 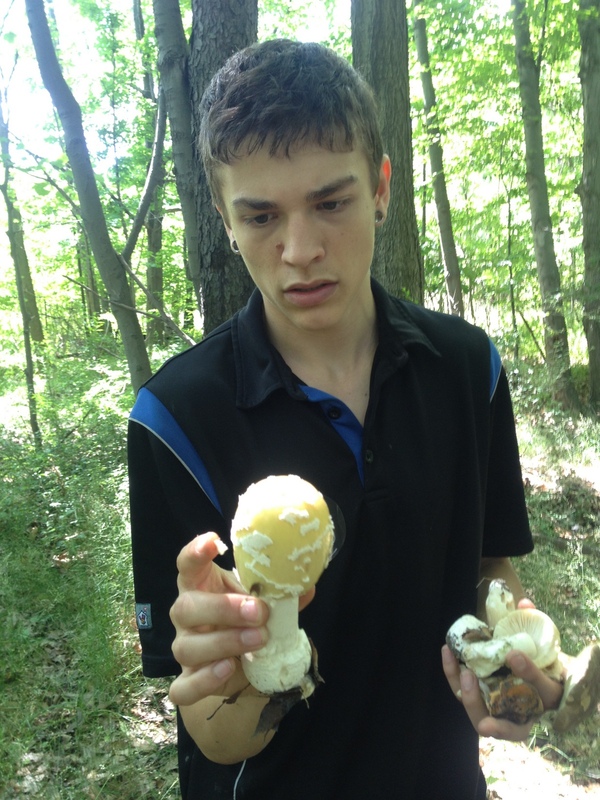 We spoke of the terminology of mushroom parts, using “Keys” to identify mushrooms, I introduced Nathan to Amanita’s, Agaricus, Boletes and some shelf mushrooms. In Nature there is nothing like a personal face to face introduction. We shared the excitement of the hunt and discovery. It really was a lot of fun!! Amanita Muscaria-Nathan Gabriel, how do you do. 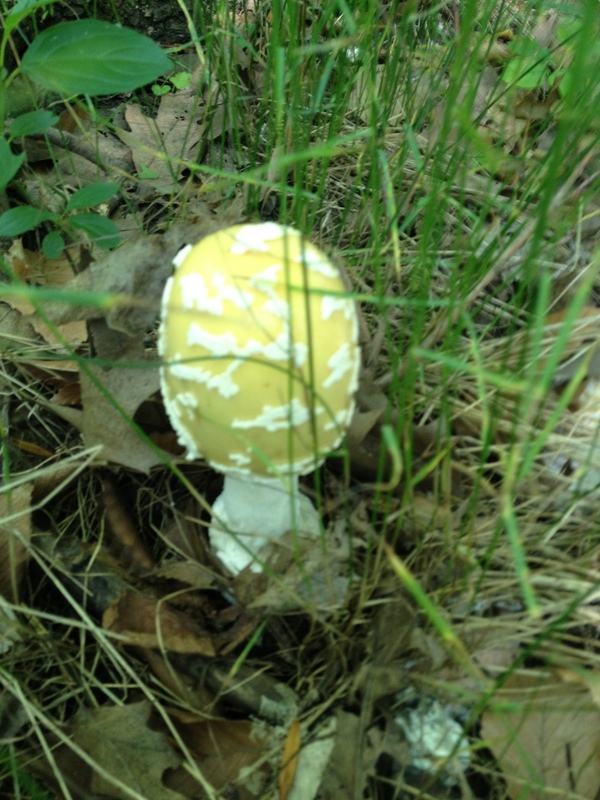 A beautiful yellow Amanita Muscaria found Nathan. At his age, I too had heard of all the mind altering possibilities that nature in her abundant variety offered us. 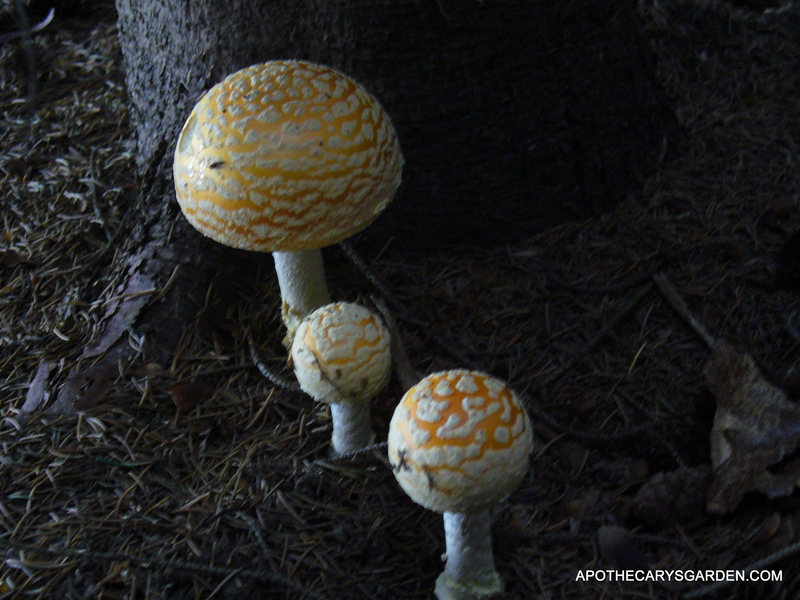 The symbolism of yellow orange or red Amanita Muscaria and how they have followed us through the evolution of our society and cultures in myth and the written word. 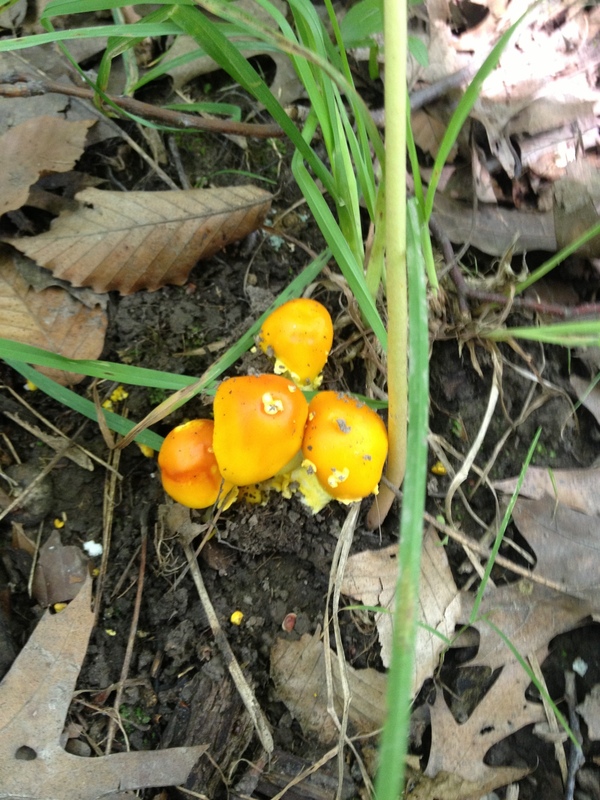 We spoke of mushrooms as food, medicine and spiritual partners. It was a perfect bonding time that just seemed to come together on it’s own. And it was also the perfect time to have some overdue heart-to-heart conversations in a setting that was probably the most conducive to communication possible. Though we lived together, we never seemed to find time to talk in this way. We spoke of what it could be like when he leaves and goes to school in another city, for him, for me. I admit I have been wondering and thinking and going through a lot of different things around Him leaving home in September. At first I thought I was exempt from any such feelings, but the past couple of months I noticed myself mulling over different future scenarios. What would that mean for me, what was happening in my life, I would be free to go anywhere, do anything, I had no reason to stay where I was, I had rooted and built my life around Nathan and he was doing as he should do at his age. Spreading his wings and leaving the nest. It would be a time of sadness and parting, but at same time, it would also be a time of new beginnings for us both. That special combination of joy and fear,excitement and anxiety,. The world is shrinking so much, distance is becoming more an illusion. Even living in the same house we did not see each other daily or communicate that much. In fact, we text each other and talk on the phone often, though we are both home. We could have been in different countries! This indeed is what I have been thinking about. 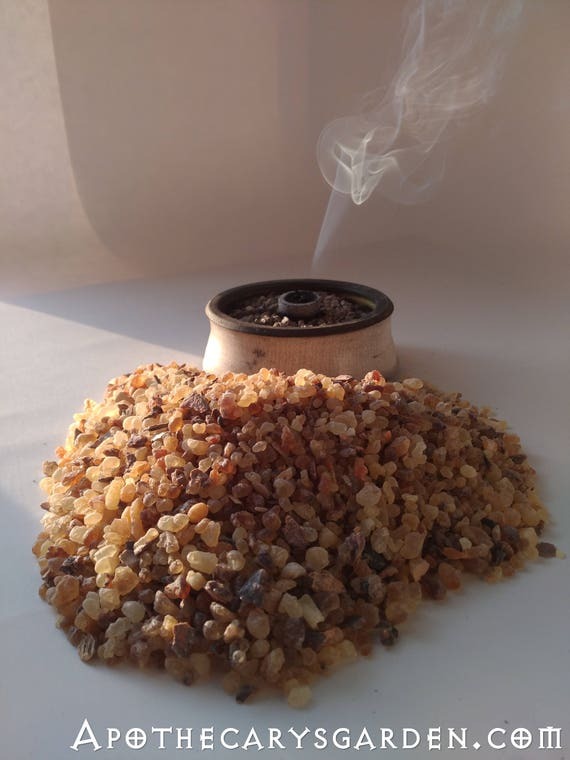 With the Apothecary business going online and generating sales through the website, I may no longer need to be rooted in one physical place. 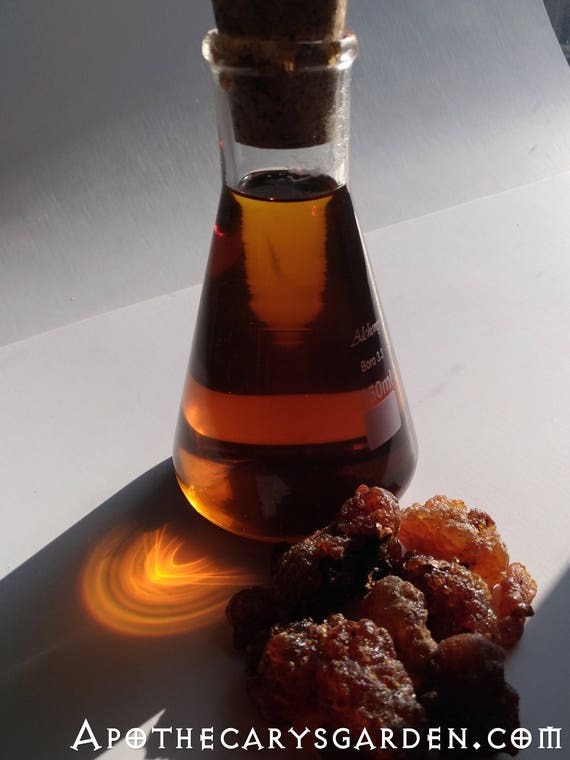 I could travel If I wanted, find rare resins and essential oils all over the world. 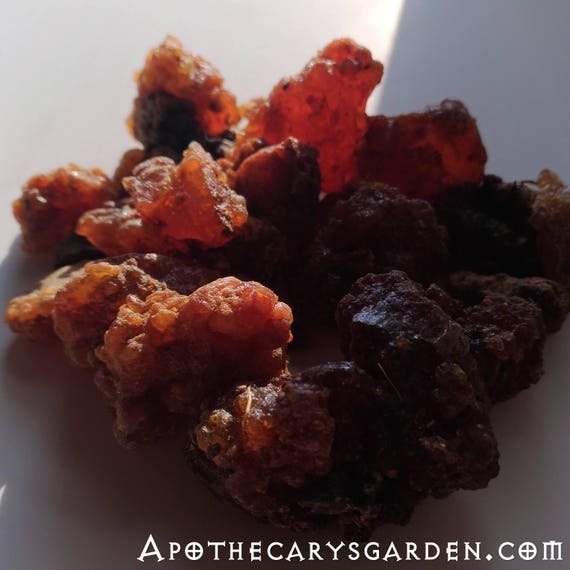 Make my oils, salves and tinctures anywhere and keep the income coming in over the internet with locally harvested plants not available here. ( Even transfer funds to him through internet banking!) Sounds exiting, doesn’t it? Though, to be honest, I know clearly, that underneath these exiting ideas and possibilities, there is some fear and sadness. There is an end to a way of life at hand, a parting of ways, and a big change that feels like the ground disappearing from under my feet. (God knows I can use all the ground I can get!!). No doubt staying focused on the positive keeps me from dwelling on the feelings of loss, and attuned to the hopeful aspects of change. This simply is part of parenthood, I am not exempt, circles within circles, a beginning and an end. As predictable as the phases of the moon and the slow plodding circuit of Saturn, Life revolves, evolves and moves forward. With or without our consent. Part of being a parent just as anything else I did with Nathan since he was born. Only easier said than done. All in all, I feel grateful for the gift of that father son moment, courtesy of wild mushrooms, the Moon and Saturn. But I will accept, that I will always feel, a little bit of sadness too. Shroomfest Explores Mushrooms and More! Of Potions, Ointments, Toads & Mushrooms. Nathan is a beautiful young man. What a touching way (in the woods with the mushrooms) to end a relationship and yet begin a new one with him and with yourself. Thank you. Kind and insightful words. I flounder with the transitions at times, feel a loss but also a joy at his blossoming. It’s been a year since I wrote the post and I am grateful we had our time in the woods together. Ahh, the wealth in the woods – what an initiation for you both! Loss of a box is the discovery of magic mushrooms beyond it, which are there all the time. The wisdom of the moon and Saturn. Also, the old old way that the young are initiated by going into the woods with or without their fathers. The Light spills out of those mushrooms. The moon’s north node completes its first circuit at age 18 and a half, when we get our key to life. Very moved. Lovely pic of Nathan. Ahhh “When we get our key to life”.. I love it, so true! The initiation, for us both, in different ways. As always, Jane, thank you for your insights and standing under the many facets of the truth.